An album of songs by Bruce Springsteen, performed by acclaimed Welsh singer-songwriter Martyn Joseph. After three decades peppering his live performances with songs by Bruce Springsteen -- and frequently being dubbed "The Welsh Springsteen" -- it was probably inevitable that Martyn Joseph would be urged by his fans to record an album of songs by The Boss. 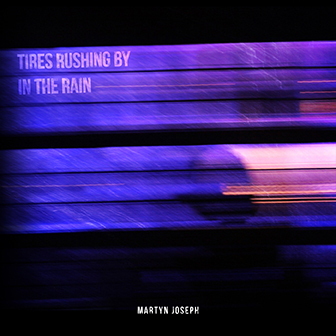 Always eloquent, this time he lets someone else's poetic lyrics do the talking, starting with the album title Tires Rushing by in the Rain, itself a line from "The Promise." Says Joseph: "I have always found a reference point in Bruce's material that I was able to connect with and make my own, and I always try to carry that honesty and integrity to the stage. Many kind folk have asked me to record an album of his songs so I decided to give it a go." His 32nd album unveils acoustic interpretations of no less 17 than Springsteen numbers, rich narrative songs given a subtle and understated interpretation, Joseph's vocal accompanied by just guitar and harmonica (and on an unpretentious "No Surrender," ukulele). Tires Rushing by in the Rain features sleeve notes by Springsteen biographer and music critic Dave Marsh, who praises Joseph's "eloquent and audacious trek" in finding something new in the songs: "This is not a tribute album in the ordinary sense. Martyn Joseph has found a piece of himself that synchs with the songs and is offering it to his listeners as a new route across the same map." Gatefold digipak. On Pipe Records, imported from the UK.